In April 2009 Thermo Fisher Scientific made a major investment in the Australasian region acquiring the Biolab Group (Biolab Limited in New Zealand and Biolab Pty Ltd in Australia). Having access to an established local distribution structure enabled Thermo Fisher to gain efficiencies for the customer by combining supply chain processes and back office support, provided previously by a mix of distributor partners and local offices. The origins of the Biolab Group date back to the establishment of the Selby Scientific business in Australia in 1863 and the formation of S A Smith in New Zealand in 1915. Salmond Industries and Smith-Biolab in New Zealand merged to form Salmond Smith Biolab Ltd with Biolab Scientific Ltd named as the scientific supply division within the Group. Biolab Scientific purchased the National Dairy Association laboratory business and LabServ Products Ltd (manufacturers of laboratory plastics). With the acquisition of Wilton Instruments, and the lab ware division of the National Dairy Association, the range of products offered by Biolab Scientific Ltd was expanded. Biolab Scientifics' instrumentation business was expanded with the acquisition of agencies from Chemiplas. John Knowles Scientific also joined the Biolab Group strengthening the New Zealand diagnostic supply business. The Tiong Group, a Malaysian based investment Company purchases Biolab Scientific and Selby Biolab. Biolab Scientific purchased Selby Scientific Limited in Australia and New Zealand from F.H. Faulding & Co. This formed the largest scientific distributor in Australasia and the Pacific. Growth through the acquisition of Activon and Irricrop Technologies in Australia strengthened Selby Biolabs' position in both the chromatography and soil science markets. A new Trans Tasman Information Technology platform established the integration of "back office" functions such as logistics and accounting, thereby creating an Australasian regional operation for Selby Biolab and Biolab Scientific. The acquisition of Science & Technology NZ Ltd enabled Biolab Scientific to expand in key areas including high tech analytical instrumentation, environmental, medical, food technology, on-line process monitoring, and biotechnology. This acquisition also enabled the Group to offer applications development support to customers. Selby Biolab acquired Australian distributor, privately owned 'Lab Supply', enabling Selby Biolab to become the largest scientific distributor in Australia. The Company changed its name to Biolab Limited in New Zealand and Biolab Aust. Limited in Australia. This name reflected the growing trans-Tasman nature of the business and the desire for the business to operate seamlessly across the region in support of its customers. The Alesco Corporation, an Australian listed Company acquires the Biolab Group. Alesco is a multidivisional distribution company operating in diverse markets. Under the ownership of Alesco, the Biolab Group acquires the Healthcare businesses of Promedica and Jacobs Medical; Environmental businesses of EnviroEquip, App-tek, Nutech, and Sensor Technologies: Industrial business of Davidson Measurement and dataTaker. Each of these companies adding further product diversity for supply into these key market segments, including the manufacture of the expanding Oda-log and dataTaker family of products. Thermo Fisher Scientific Ltd acquires the Biolab Group from Alesco Corporation. By combining operations, it will be easier for customers to do business in supply of the products previously ordered from Biolab, Thermo Fisher Scientific and numerous other distribution channels - now from one source, with one phone number, one e-commerce platform and all on a single order. By combining sales and service teams there is now a continued enhancement in the depth of expertise and expanded geographical presence to better support customer requirements. 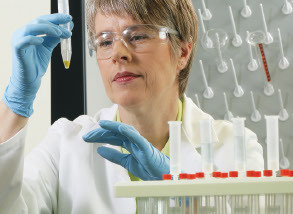 As the world leader in serving science we are uniquely positioned to combine our unrivalled depth of product, application and service expertise with our extensive range of Scientific, Healthcare, Environmental and Industrial Process products to provide tailored solutions for each and every customer.